Distant view of Benares with two men catching turtles in the foreground from the Mandakini tank. 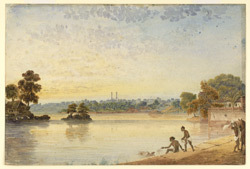 bl.uk > Online Gallery Home	> Online exhibitions	> Asia, Pacific and Africa Collections	> Distant view of Benares with two men catching turtles in the foreground from the Mandakini tank. Water-colour painting showing a distant view of Varanasi in Uttar Pradesh with two men catching turtles in the foreground, by James Prinsep (1799-1840) in 1826. Inscribed on the reverse is: 'City from the NW corner of the Mundakinee Tulao, 10 Oct 1826'. This painting was reproduced in 'Benares illustrated' and lithographed by J.D. Harding. The tank was drained by Prinsep, who wrote: 'The Mundakinee being stocked with turtles, which where looked upon with veneration, and regularly fed by the Hindoos, a merchant volunteered to pay two annas a head for all that should be removed alive into the river upon the draining of the tank. The number thus caught and transplanted exceeded 1500 ....'.